The normal names continue to head betting odds when it comes to who might win the NBA MVP this coming season. That obviously includes NBA Finals rivals LeBron James and Kevin Durant, among others. While it’s highly likely that one of these true stars will take home the Association’s top individual honor this season, we’re here to focus on under-the-radar candidates for the Maurice Podoloff Trophy. That list includes a budding young star in Salt Lake City, a boisterous center in the City of Brotherly Love and a man that overcame LeBron James’ shadow to excel in Beantown. Here’s a look at 10 under-the-radar NBA MVP candidates heading into the 2018-19 season. Mitchell’s excellence as a rookie was somewhat undermined by a ridiculous vote that enabled Ben Simmons to become the NBA’s most-recent Rookie of the Year. While the comparisons were strong, Simmons was actually drafted back in 2016. This award should have been handed to Mitchell with no questions asked. There’s good news here. The 22-year-old Mitchell might be shooting for an even greater distinction this season. 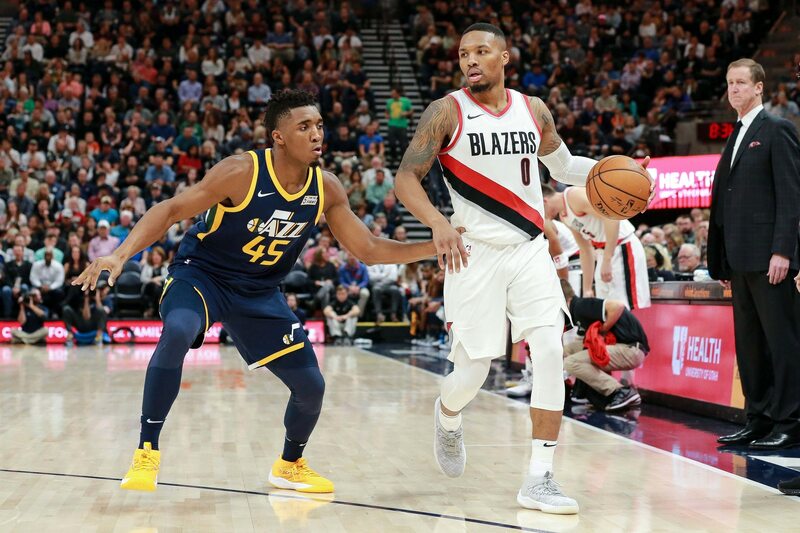 After leading a 48-win Jazz team in scoring last season, Mitchell’s presence among the top young players in the NBA is already cemented. His ability to star on the game’s grandest of stages for a team that had lost franchise stalwart Gordon Hayward months earlier tells us a story of a man that will vie for multiple MVP awards when all is said and done. That could start during the 2018-19 campaign. Embiid noted this past offseason that the process has extended to MVP consideration. And while teammate Ben Simmons might warrant a mention here, it’s this young center that seems to be the glue that keeps a championship contending Sixers team together. Philadelphia boasted a 41-22 record with Embiid in the lineup last season. It was just 11-8 in the 19 games that he sat. That tells us a story of an extremely valuable player. Statistically, Embiid has been something of a revelation. He averaged 22.9 points, 11.0 rebounds, 3.2 assists and 1.8 blocks per game last season. The 7-foot center also extended his game to beyond the three-point arc, hitting on 31 percent of his attempts from distance. If the Sixers take that next step to 60-plus win territory this season, Embiid will be a true MVP candidate. Surprisingly listed among our top-25 players heading into the season, what Oladipo did for a Pacers team that many expected to be in the midst of a rebuild last season was nothing short of extraordinary. After being considered a central part in the package that sent Paul George to Oklahoma City during the summer of 2017, Oladipo actually outperformed his counterpart in his first season with the Pacers. Here’s a kid that averaged career bests in points (23.1), rebounds (5.2) and assists (4.3). He also led the entire Association with 2.4 steals per game. It resulted in the Pacers posting a 48-27 record in games Oladipo played in. The team was winless in the seven games he missed. Think about that before concluding Oladipo isn’t among the most valuable to his team in the NBA. Denver might be lost in the shuffle when it comes to a top-heavy Western Conference this coming season. In no way does that mean Mike Malone’s young squad won’t make some noise when all is said and done. The Nuggets boast one of the most-talented young groups in the entire NBA. That’s led by the recently re-signed Nikola Jokic, who has turned heads in his first three seasons in the Association. Last year alone, the former second-round pick averaged 18.5 points and 10.7 rebounds. He also dished out an otherworldly 6.1 assists from the center position. Jokic’s presence in Denver opens up the offense in a big way. He’s a catalyst, a go-to scorer and someone who can find the open wings. Last season repesented this to a T. And at just 23 years old, the kid still has not hit his prime. Pretty much the Rodney Dangerfield of the NBA, when is Lillard going to get the respect he deserves? Sure there’s still issues on defense. But he’s among the most-feared guards in the entire league, right up there with James Harden, Russell Westbrook and Stephen Curry. Consistently proving himself to be a top-notch scorer, Lillard averaged 26.9 points per game last season. He scored 30-plus in 25 of his 73 games. To put this into perspective, Curry reached that plateau 17 times in 51 games. It seems a bit absurd to focus on a supporting cast when analyzing someone’s MVP candidacy. As it relates to Lillard, that’s pretty much what we have to do. Portland will never be taken seriously until players outside of Lillard and C.J. McCollum step up. And in reality, that could impact his standing as a true league-wide star moving forward. As the likely top dog in the Eastern Conference this coming season, Boston’s expectations are at a near-decade high. Such is the nature of the beast when LeBron James departs for the left coast, leaving behind scrape back east. But this could ultimately be a major boon for Irving and his Celtics. Proving himself capable of starring for a contending team, Irving’s Celtics posted a 41-19 record in the 60 games he suited up in. He also 24.4 points and shot 49 percent from the field in his first season with the Celtics. No other member of the team averaged as much as 15 points per game. That’s true MVP-caliber stuff right there. Now that Jimmy Butler is likely headed to another NBA city after one season in Minnesota, the Wolves are going to officially be Towns’ team. Whether that leads to success we haven’t seen in recent seasons remains to be seen. There’s still issues on the defensive end of the court, KAT and fellow youngster Andrew Wiggins being the main culprits. But offensively, Towns continues to prove himself to be among the most-feared bigs in the game. At just 22 years old, the former No. 1 overall pick averaged 21.3 points and 12.3 rebounds while posting a ridiculous .596 effective field goal percentage last season. Even sans Butler, Minnesota has the talent to win 50-plus games in a loaded Western Conference. Should he improve defensively, it wouldn’t be a shock if KAT earned some MVP recognition. After all, the kid is still nowhere near hitting his prime. James Harden won the NBA MVP last season. That’s fine. It was well-deserved. But let’s face the music right now. He was not the most valuable player for a Rockets team that won 65 games and was one victory away from the NBA Finals. That distinction goes to this future Hall of Fame guard. Dealing with injuries during his first season in Houston, Paul was sidelined 24 games. In those two-dozen outings, the Rockets posted a 16-8 record. Not bad. But in the 58 games Paul suited up in, Houston was a stealth-like 49-9. Once Paul was sidelined to injury in the final two games of last season’s Western Conference Finals against the Warriors, Houston fell flat. It lost both games with Harden himself shooting a combined 22-of-53 from the field and turning the ball over 14 times. Lost in all the drama surrounding Kawhi Leonard in San Antonio last season was the fact that Aldridge might have had the best season of his illustrious career. Months after being bandied about as trade bait, the six-time All-Star averaged 23.1 points and 8.5 rebounds while shooting 51 percent from the field. This enabled an injury-plagued and talent-stricken Spurs team to earn yet another playoff appearance. While championship contention is unlikely this season, the addition of DeMar DeRozan in the Leonard trade will help San Antonio stay afloat. If that were to happen and assuming Aldridge continues to shine, he’ll have to be mentioned as a potential MVP candidate. For much of the 2017-18 season, it appeared that George was ready to play out his one year in Oklahoma City and move on to his hometown of Los Angeles. That didn’t come to fruition. Having built a strong relationship with former NBA MVP Russell Westbrook, George committed to the Thunder long term this past summer. This is going to be huge for the All-NBA performer. Now that he’s not a lame duck and understands he’ll be in OKC for the next several seasons, we fully expect George to settle in quite well. And with an all-around game that actually bests Westbrook, a strong team-wide performance in 2018-19 will lead to true MVP consideration for one of the game’s most-underrated stars.